Is Samsung's Dual Pixel camera tech on the Galaxy S7 true phone innovation? We are pretty spoiled these days when it comes to what our phones can offer, to the extent that a pretty svelte handset like the HTC 10 has been called unremarkable in many a review around the Internets just because it doesn't offer that little something extra that can make it unique, like a curved panel, a modular design, or a 3D-touch display. These, however, while intriguing, aren't indispensable and used on an everyday basis by their respective phone owners, as anecdotal evidence, and most of our polls show. For something to be called "innovation," no matter how overused this word is nowadays, it has to be both unique and truly useful, that is why we were curious what do you think about Samsung's Dual Pixel camera technology that made a cameo with the new Galaxy S7 and S7 edge. It ticks both boxes, as no other handset has it, and it really adds to the camera experience, catapulting Samsung to the top place in the fastest phone shooters as per our own measurements, not to mention how crazy fast the continuous autofocus behaves while shooting video in any condition. 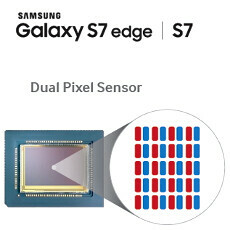 As a reminder, the Dual Pixel sensor on the Galaxy S7 and S7 edge employs two photodiodes for every single pixel, so instead of 5-10% of the dots being used for focusing (like on the iPhone 6s or Note 5), all of them take part now. While not a unique camera technology, that's the first time it's being used in a phone, and the implications for focusing speed and accuracy are huge, especially with moving objects, live footage, or in low-light scenarios. So, is Dual Pixel worthy of the "innovation" crown, or is it a cool, but unessential gimmick, when compared with the cameras of competing handsets, what do you think? What else would you call it? We don't have any other phone sporting it, plus it works like a charm and y'all are witnesses. It's definitely not a gimmick, fast focus allows for some great low light shots as well, focusing in low light was always a pain but not with dual pixel. Less blurry, out of focus pictures in low light is a good thing. There's a lot of things I would call gimmicks, the camera being able to instantly focus, without any worry what so ever, is not one of them however. I could wonder why you say it is a gimmick, but I want to point out that many other features that have been said are innovations, on both android and iphone, existed in one shape or another before they got them so by your words there has been no 'true' innovation, just improvements over time? Innovation is when that development takes a leap forward if you ask me, and this definitely feels like one. you stupid troll, samsung produce the sensores and extend some orders to sony just to cover the demand. Licence? Dude, you clearly have no idea what you are talking about. You had not tried hard enough, try again. Post #31 Not here. Many Samsung fanboys will attack you. They know that you are right and they will quickly dismiss the fact no matter how true it is. This is a paid Samsung article, and every paid Samsung commenters are here, liking all the positive comments building a hype around a gimmick. You can tell the difference from organic comments to generic "wow this feature is awesome" comments. Samsung makes their own sensor. They use Sony to manufacturer the same sensor under Sony own name. Licensing a sensor has nothing to do with how the optics work dummy. After all, Apple gets sensors from Sony too, yet they don't do a good job with it. Namely the iPhone 6S taking worse.pics than last year's model. Even Sony doesn't do a good job with their own sensors in their own phones. So yeah you can brag when you take something someone else makes and do a better job with ot.. You're just mad because your phone doesn't have it. Today I learned Richard Yarell rapidly spams the text suggestion words that pop up on his mobile keyboard. He's been doing it since 2008 on Phonedog. lol i was just about to say the same thing. he has a point here though. Why hate on the man? Ok, so he doesn't use correct punctuation. You get the point. Who knows, English might be his second language. I'm sure you wouldn't be as fluent in writing another language. Cut the guy a break. If it bothers you THAT much, don't read his comments when you see his Name and Avatar. I think he slams his face on the keyboard, then autocorrect does the rest. I'm amazed at People who like his comments. Samsung marketing dominate android world nothing else.. They are the true innovators, especially in android. Its pretty much plain and simple!! U R A SPAMMING IDIOT!!! I would like to ask those voting No, what makes them think like that? Because if i understand correctly, rather than pushing for pixel size they made all of them to split the pixel and reduce the sensitivity of the pixel. Yes it might be fast but if you can do it with less why waste all the area? Cmiiw though.